Arthur A. Levine Books, 9780545210669, 288pp. 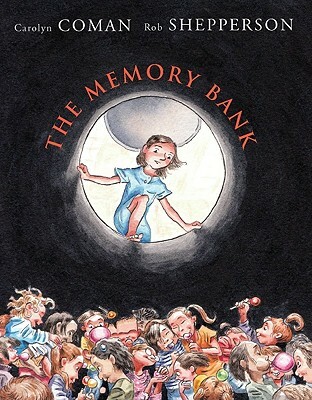 The Memory Bank is the story of Hope Scroggins, who lives with her beloved sister Honey and the Dursley-esque parents they share. In fact these parents are SO horribly awful that one day, when the sisters disobey the rule against "no laughing", they banish Honey forever, telling Hope that she must simply "forget" her. Carolyn Coman was born in Evanston, Illinois, and graduated from Hampshire College, where she studied writing. She is the author of WHAT JAMIE SAW, a Newbery Honor book, and MANY STONES, a Michael L. Printz Honor book. Both books were also National Book Award Finalists. She lives in New Hampshire. Rob Shepperson's drawings appear regularly in the New York Times, the Wall Street Journal, and the Washington Post, and he illustrated THE BIG HOUSE, by Carolyn Coman. He lives in Croton-on-Hudson, NY.